Too many buyers choose fashion over function when purchasing athletic shoes. They don’t realize that poor-fitting shoes can lead to pain throughout the body. Footwear plays an important role in the functioning of bones and joints, especially for runners and other athletes. Choosing the right shoe can help with pain management in the back, hips, knees, and feet. There is no such thing as a perfect athletic shoe because every pair of feet is different and every shoe has different features. But the deciding factor in getting as close to perfect as possible should be the overall comfort. For this key reason, it is recommended that you first determine your foot type: whether your feet are normal, flat, or high-arched. When determining your type, consult with your chiropractor or doctor. He or she can help determine your specific foot type, assess your gait, and suggest the best shoe match for chiropractic care. Normal feet have a normal-sized arch and leave a wet footprint that has a flare but shows the forefoot and heel connected by a broadband. A normal foot lands on the outside of the heel and rolls slightly inward to absorb shock. 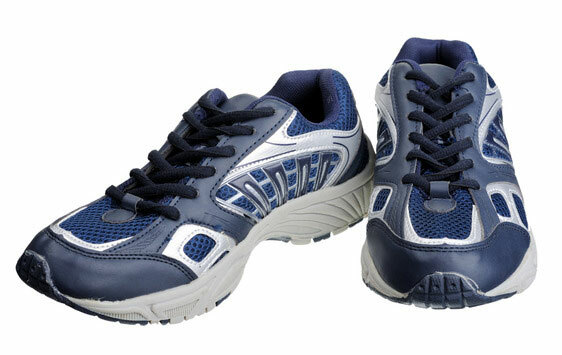 Best shoes for normal feet: stability shoes with a slightly curved shape. A flat foot has a low arch and leaves a print that looks like the entire sole of the foot. This usually indicates an overpronated foot–one that strikes on the outside of the heel and rolls excessively inward (pronates). Over time, this condition can cause overuse injuries. Best shoes for flat feet: motion-control shoes or high-stability shoes with firm midsoles. These shoes should be fairly resistant to twisting or bending. Stay away from highly cushioned, highly curved shoes, which lack stability features. A high-arched foot leaves a print showing a very narrow band–or no band at all–between the forefoot and the heel. A curved, highly arched foot is generally supinated or under-pronated. Because the foot doesn’t pronate enough, it’s usually not an effective shock absorber. Best shoes for high-arched feet: Cushioned shoes with plenty of flexibility to encourage foot motion. Stay away from motion-control or stability shoes, which reduce foot mobility.